Image sensing applications in several spectrum region as infrared, UV, or X-Rays, comprise one of the fastest growing segments of the semi-conductor industry, largely due to the incredible advances made possible by flip chip technology. While compression bonding has quickly become the standard technique for IR/FPA applications (successfully achieved on SET bonders), SET is proud to be pioneering the use of advanced reflow techniques that offer many major advantages. The SET's reflow technique offers carefully controlled thermal cycling and joint shaping capability to reduce stress on the joint and assure reliable connections with a high accuracy rate. For those who desire high force compression bonding, for example at room temperature, the stable granite base and extreme compression bonding capabilities of SET bonders have no equal in the industry. Meanwhile, SET advances in high-resolution imaging and laser leveling capabilities make high accuracy bonds even more achievable, controlling and guarantying precise parallelism. The SET Technical Bulletin n°3 is a compilation of technical articles written by some of our customers. 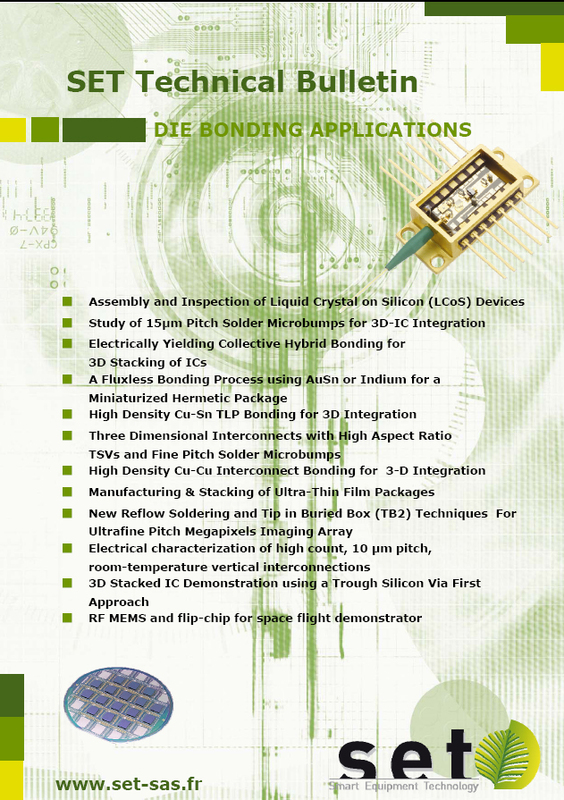 Neatly organized and presented, each article provides unique insights of die-to-die and die-to-wafer bonding.